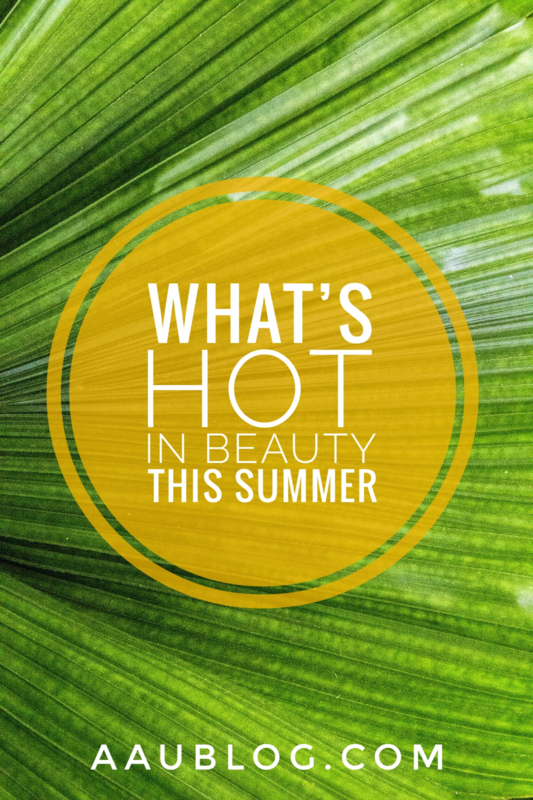 What’s Hot In Beauty This Summer? As temperatures soar I immediate start to think of my “summer swaps”. I wrote last winter about skincare changes to suit the chilly air, and now it’s already the time of year to make another switch! The summer is a time to rejoice in holidays and vitamin D, and I for one can’t wait for it to be in full swing. It’s the perfect time to nab yourself some hot beauty must-haves to make summer 2018 as fabulous as you are! 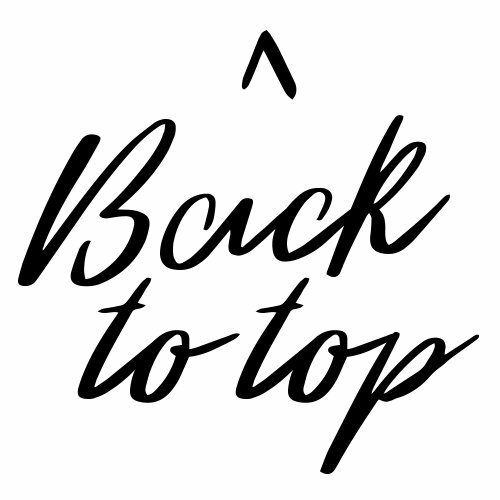 I’ve been scouring the shelves for new finds and perusing my very favourite online boutiques for the best in the new season, and without further ago here they are… enjoy! 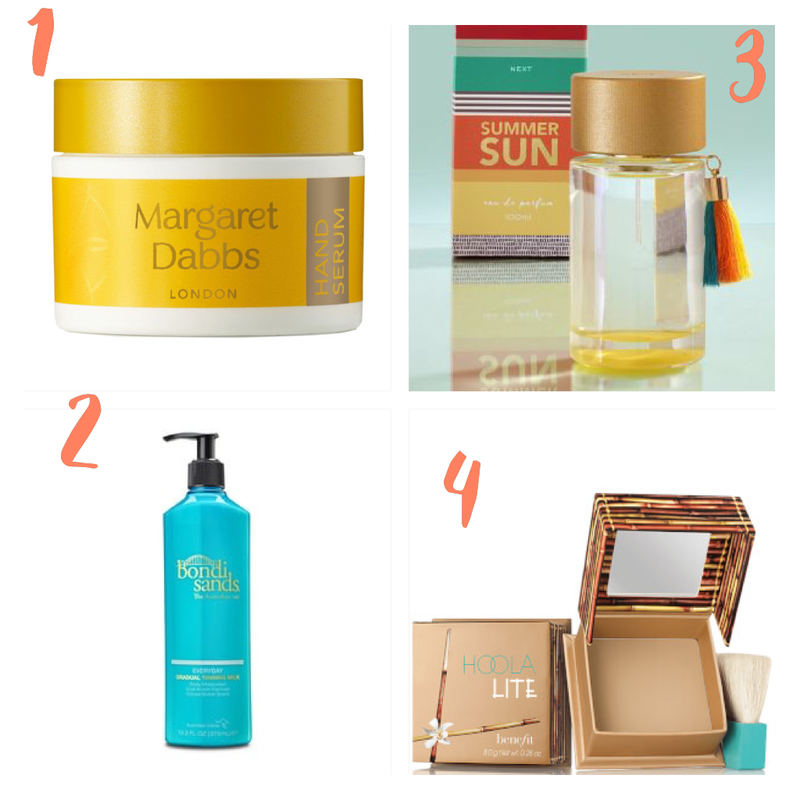 I first came across Margaret Dabbs products when her world famous foot cream was being sold in Marks & Spencer’s plush new beauty department a few years ago (a fantastic retail move by the often overlooked fashion giant). Since then, she’s expanded her range and I should have known that her hand care collection would be just as good and just as popular. As well as a fabulous hand cream, she has also released this amazing hand serum which I’ve fallen completely in love with. The price tag might leave some of you (myself included) with watering eyes, but if you suffer with dry hands and you want something that works then this is the product for you! A little goes a long way, I’ve been using mine for a few months and I’ve barely made a dent in the 30ml pot. Use along side her Intensive Hydrating Hand Lotion for a real treat. Find it here. When customer reviews are branding this product as the holy grail of gradual tanners, it’s time to sit up and listen! I don’t think I’ve seen another tanning product with the same amount of hype and rave reviews. It’s without doubt a wonderful lotion, a great smooth texture and none of the awful smell you usually associate with even the mildest of fake tans. Perfect for all skin types, but especially good if you’re a pasty gal like me! You get a nice big size with a pump dispenser making application super easy. There is also a facial milk option for the same price if you’d like a faux glow all over. Find it here. Ok, let me say this straight away… this is a complete dupe of Estee Lauder’s Bronze Goddess perfume a.k.a pure summer bliss in a bottle! It smells so similar to my nose, so if you have ever smelt Bronze Goddess and are looking for a similar aroma for a tiny fraction of the price then look no further. They come in a range of sizes from a purse-friendly 10ml tube to a lovely 200ml size for your dressing table. The wonderful notes of coconut remind me of suncream and completely transport me to beach holidays gone by. Find it here. I was SO glad when Benefit came out with a lighter shade of their world famous Hoola Bronzer, one of their most popular products. As well as suiting my fair skin, it’s a lot more user friendly as you almost can’t go wrong! 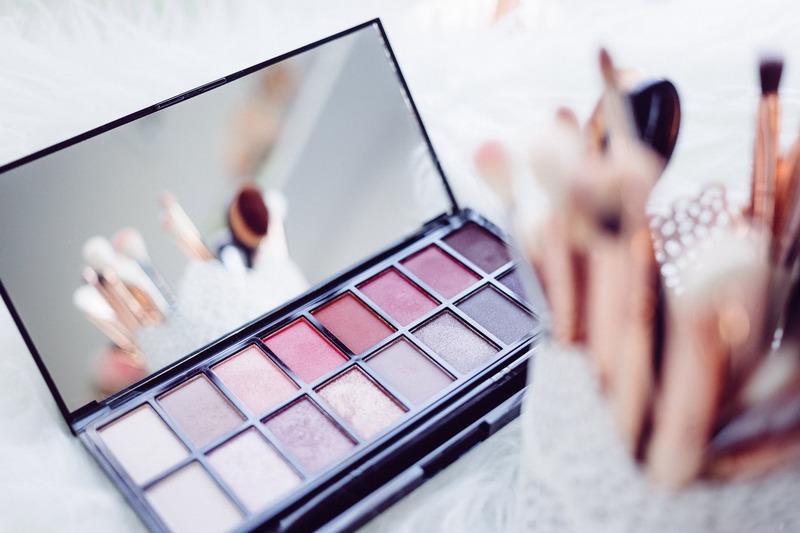 A versatile and flattering shade, it can replace your contour kit and blusher and save you valuable time in the morning. It’s incredibly believable as it’s in a soft-matt formulation so glides on with ease using the dinky brush it comes with. Although perhaps a little pricier than other bronzers, this one will last you a VERY long time so see it as an investment and treat yourself! Find it here. Becca highlighters are gorgeous and are regularly in high demand for their gorgeous finish and soft texture. Their new offering this season is a beautiful warm golden honey shade which suits everyone. In the summer, I rarely hold back with highlighter and I’ve been known to use it from cheekbone to collarbone – everywhere the light will hit. An excellent quality powder like this won’t ever look overdone, but will leave you with a “lit from within” glow that your friends will be envious of. Find it here. Can you hear the hallelujah chorus?! This is one of the most stunning eyeshadow palettes on the market with truly useful complimentary colours. The website describes them as “buttercream shadows” because they swipe on eyelids so super smoothly and blend together like a dream. This particular collection of shades is limited edition (only 6 per customer!) and has an array of bronzes, coppers, and champagnes. If I haven’t already convinced you, they require no eyeshadow primer to stay put and they are 100% vegan! Find it here. I’m usually a fan of hot cloth cleansers because I love how clean my skin feels afterwards. However, in the summer months there’s nothing I’d want less than a hot flannel on my skin in my already stifling bathroom! This cooling cleanser is part of Neutrogena’s new Hydroboost range which they’ve been expanding in the UK since last year. I love the texture and how quickly it dissolves makeup, sunscreen, and impurities with ease. Rinsing off with water is all that’s needed with this, so no faffing! Find it here. Sun protection is a big deal and with fair skin I’m normally the first to reach for the bottle. In the past I’ve used Ultrasun, which make fantastic products. However, they are expensive and I couldn’t sustain buying them very often. I saw that this was a new product on the market and decided to give it a go. It has a really light feel and has zero stickiness (so even the kids won’t mind being spritzed!). The cooling spray is enriched with aloe vera and leaves the skin feeling hydrated rather than a slimy mess. I love how this product is also water resistant so you don’t have to put off your dip in the pool. They are available in SPF 20 and 30 to suit your needs. Find it here. 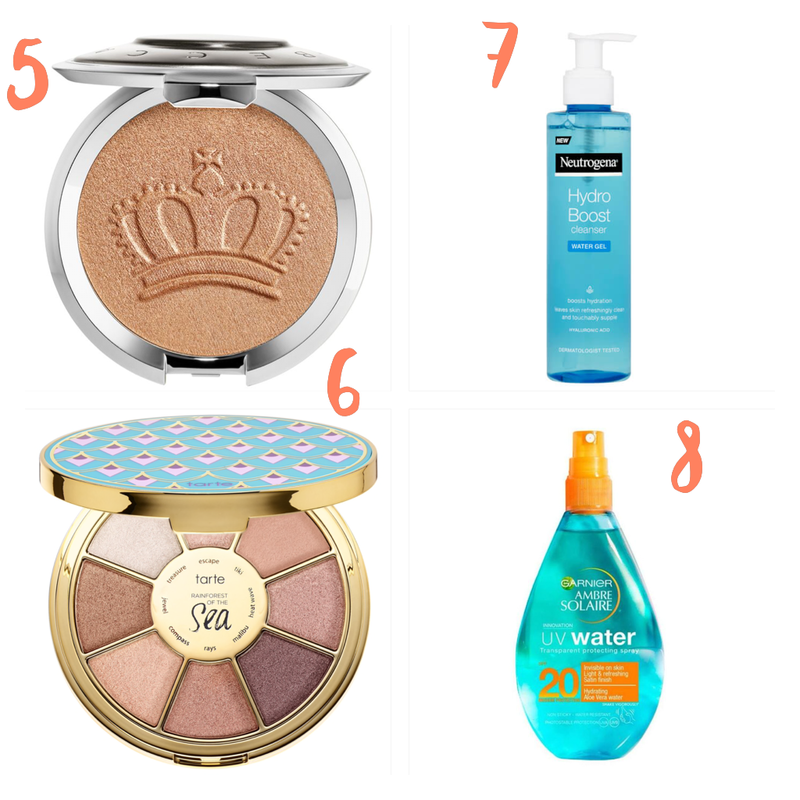 I hope you like my beauty picks! 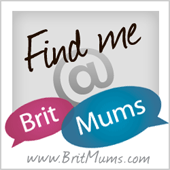 This post is ace! I couldn’t agree more about making seasonal swaps. My go-to beauty items for summer are waterproof eyeliner and bronzer along with a nice lip colour. Can’t beat that! Ooh perfect yes great ideas! I love mixing up my makeup for Summer, the perfume from Next sounds great value!